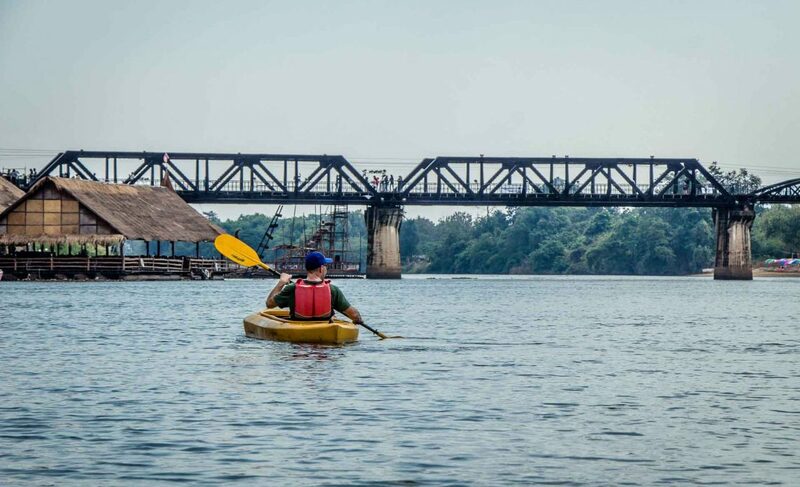 Kanchanaburi, Thailand is best known as the home of The Bridge over the River Kwai, but we were drawn there by the amazing outdoor activities. In three full days, we were able to do our three favorite outdoor activities with our kids (aged 3 & 5); hiking, biking and kayaking. Train: This option will appeal to history buffs as the Bangkok to Kanchanaburi train crosses the Death Bridge. All trains are 3rd class (i.e. : wooden seats and no air conditioning) and depart from the Bangkok Noi train station. Tickets should be purchased at the train station. The journey takes approximately 2 hours. Minivan: Multi-person minivan’s depart from Bangkok to Kanchanaburi from Khao San Rd and Chatuchak minbus terminal (at the north bus station). The journey takes about 2.5 hours. Keep in mind, if you have a large bag, you will need to buy a seat for it too. Click here to book your minivan tickets. Taxi: As you’d expect, a Bangkok to Kanchanaburi taxi will be your most expensive option, but given it’s in Thailand, it’s still not that expensive for a 2 hour ride. Parents traveling with kids will find this the most convenient option and the only one that offers child seats for small kids. Click here to book your taxi. 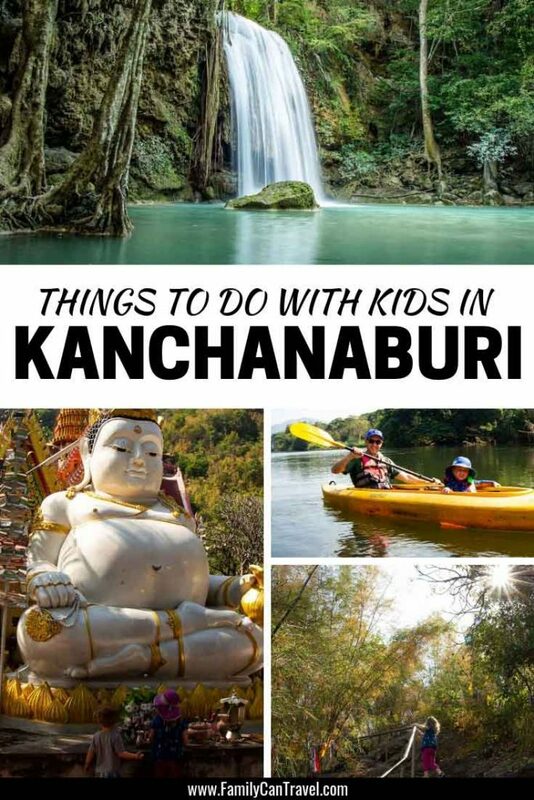 Day Trip: If you don’t wish to stay in Kanchanaburi, a day trip from Bangkok is a great option. This highly rated day trip includes a ride on the Death Railway, war museums and a long-tail boat ride along the River Kwai. How we got from Bangkok to Kanchanaburi: We traveled by taxi from our Bangkok Airport hotel to Kanchanaburi. We booked our taxi trip using 12Go.asia as it allowed us to easily compare our options and find one that offered child seats. We didn’t spend any time in Bangkok on this trip, but here’s a great list of things to do in Bangkok with kids. After demolishing a huge buffet breakfast at our hotel, we walked to the main street to rent some bikes to visit some Buddhist temples nestled in the beautiful limestone karst mountains outside of town. 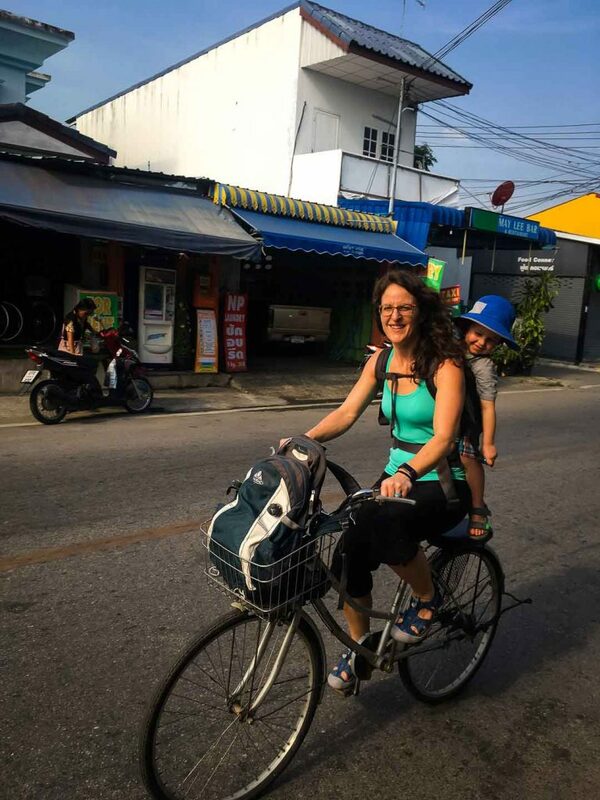 We figured no one would rent bikes with child seats in Thailand, so we brought our own child carriers with us from Canada. We weren’t sure if they’d work ok on bikes, but they worked really well! 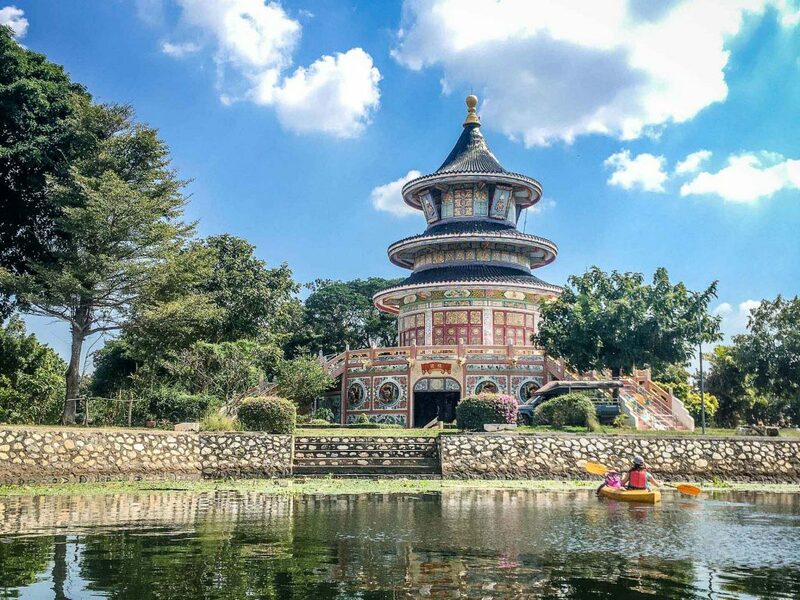 There are many beautiful temples in Kanchanaburi and we picked the one which looked the most fun to bike to. We rented two single-gear bikes from a very friendly couple for 50 baht each for the day (roughly $1.60 USD each). We were glad the bikes had baskets on the front as we were able to put our day bags in while the kids were on our backs. 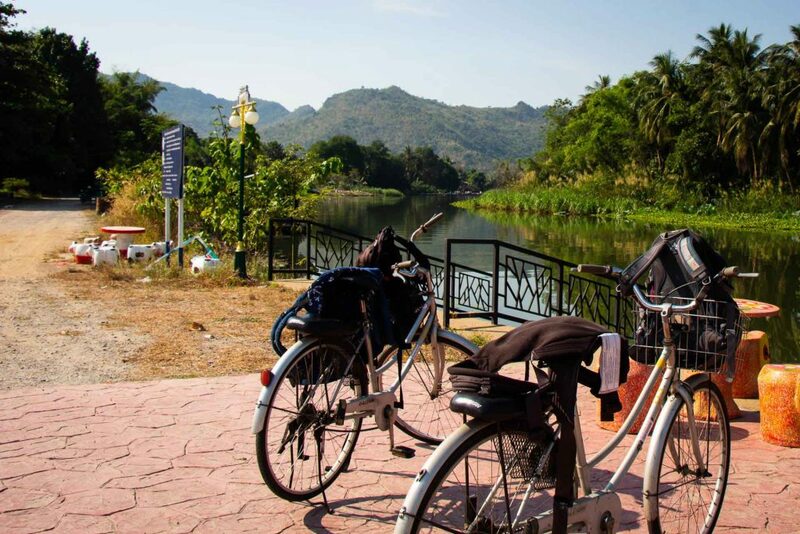 The first half of the ~8mile (13km) bike ride to Wat Ban Tham was through Kanchanaburi. The roads were busy, but not too crazy. The Thai drivers are very courteous and we never felt in danger. In fact, many drivers slowed down to wave at the kids and a few local cops even slowed down to give the kids a big smile and a thumbs up. The Thai people are so friendly and they really made our kids feel special. Our ride through town took us past a beautiful temple, an outdoor market, alongside the river and through quiet residential streets. This type of experience is what we love most about active travel – renting bikes allows us to see parts of town that 99% of tourists never see. The locals are so happy and welcoming to see you there, it’s such a special experience. After a while we crossed over the River Kwai and turned down a country road towards the temples. This road was quite busy with many large trucks on it – but again, we never really felt in danger. This road was sandwiched in between the River Kwai on one side and beautiful, tree covered limestone karst mountains on the other. 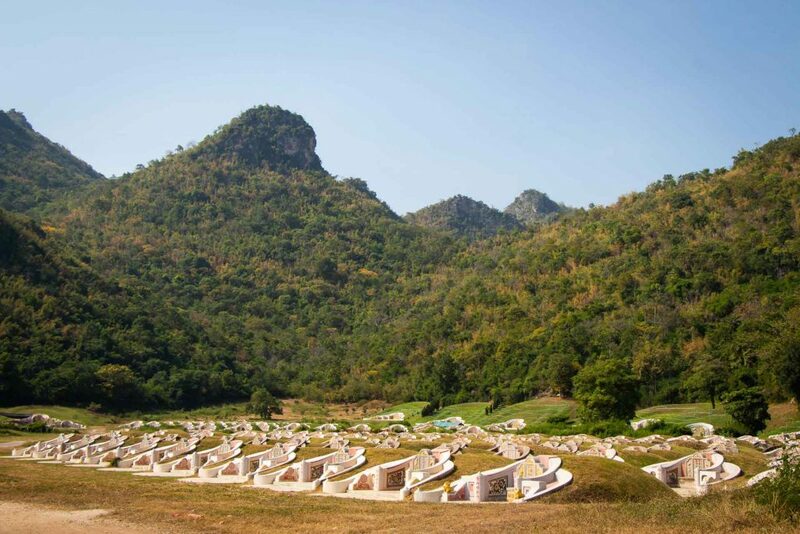 We passed the most interesting cemetery along the way, located in a field below a karst mountain. The cemetery was filled with tombstones in the shape of semi-circles and the visual effect of a whole field of them was really quite amazing. Before long, we arrived at Wat Ban Tham and locked up our bikes. The kids played on some concrete animals while we ate some grilled bananas bought from the market in the parking lot, which to be honest weren’t that good. After our little break, we began to climb up the mountain to the temple at the top. The climb begins with Thai-style dragons on either side of the staircase. 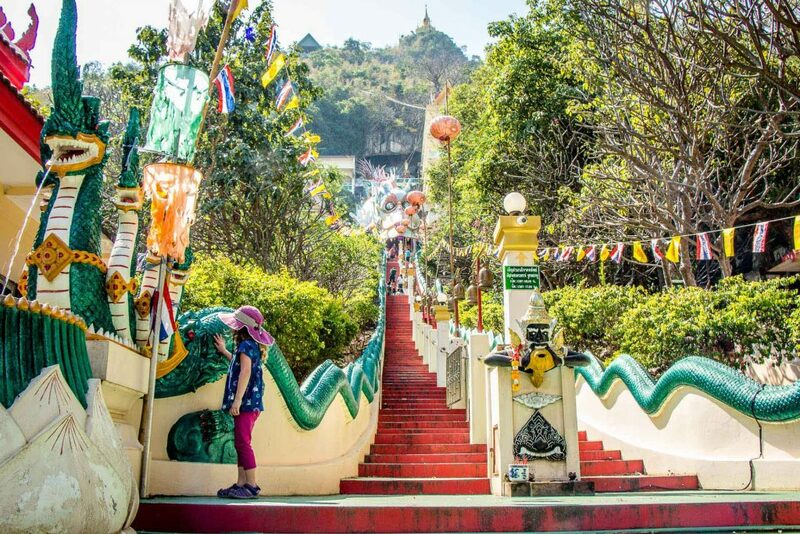 After a while, the outdoor stairs end and you walk through the mouth of a dragon and you climb the stairs higher through the belly of the dragon, with many Buddhist scenes painted on the walls along the way. 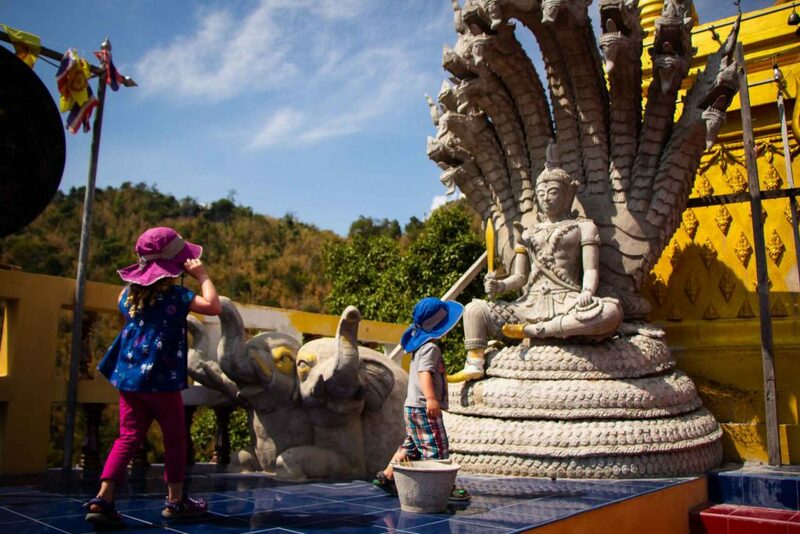 At the top of the dragon stairs, you take off your shoes and enter a cave, where there are several statues of Buddha. 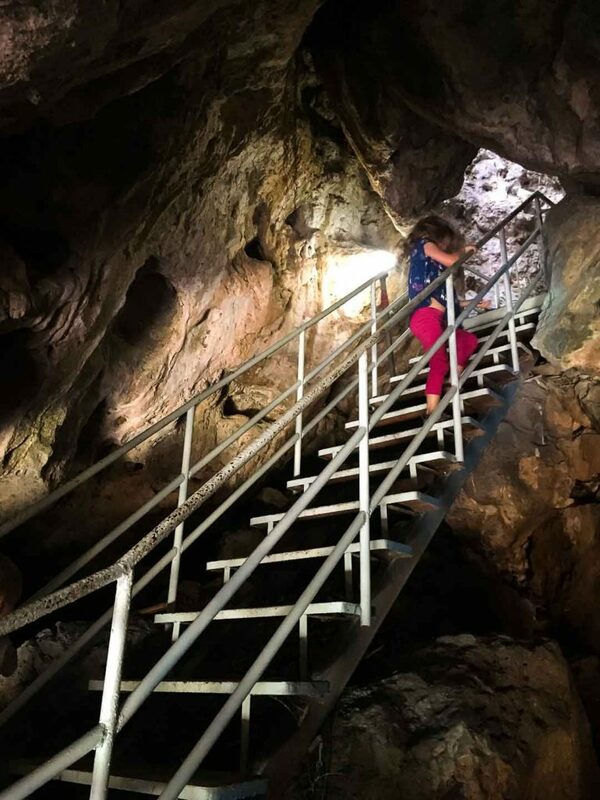 After a short while, we resumed climbing the stairs – this time via a steep spiral staircase. This soon transitioned to carved rock stairs in a forest for the rest of the climb. There was another small temple along this stretch which was an excellent place to stop and enjoy the views of the river and countryside. The trees provide nice relief from the powerful tropical sun. At the very top was a golden stupa with two Buddha’s sitting in front of many-headed dragons, which even the kids thought were pretty cool. The views from the top were amazing, but it was also in the open sun, so it was very hot and we didn’t stay long. Both kids walked the whole way up all by themselves (~500 feet elevation gain). The steps were steep in parts, so we put them in their carriers and carried them down. We renewed our energy with some chicken skewers and bottled water from the market before hopping on our bikes to go home. 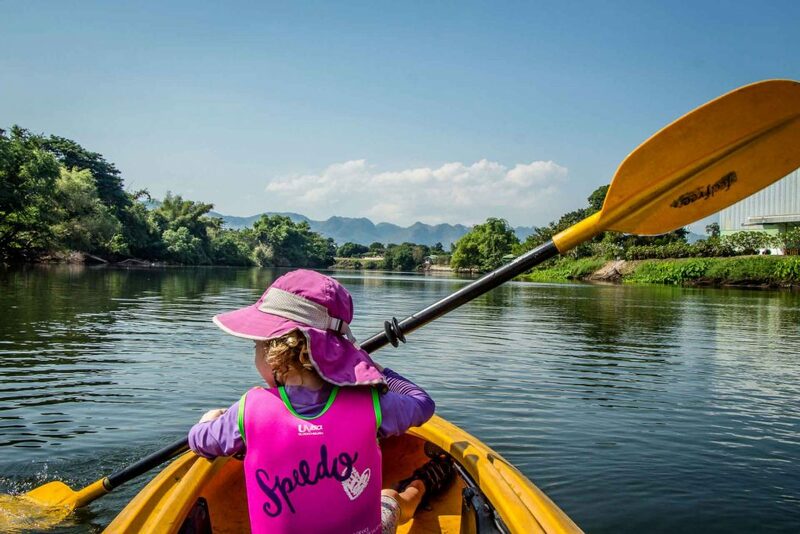 With a world-famous bridge and a tranquil river, the conditions are optimal to go kayaking in Kanchanaburi. 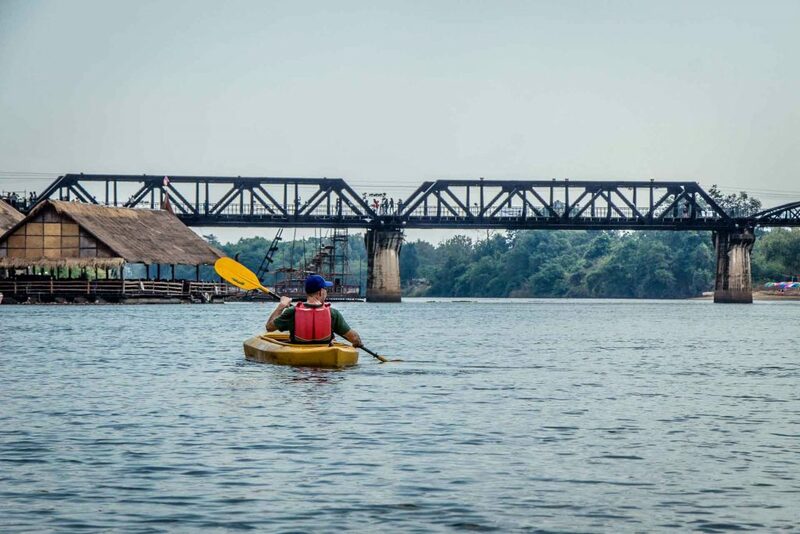 Based on a recommendation from our Lonely Planet, we walked to River Kwai Canoe Travel Services to arrange a kayaking trip for the day. The owner was there right on time to open the store. When she saw the kids, she immediately hugged and kissed our 5-year old daughter and then tried (unsuccessfully) to do the same with our 3-year old son. After discussing our desired trip, she said she’d swing by our hotel to pick us up at 10am. Shortly after 10, she arrived in her truck with the two kayaks hanging out the back. We climbed in the back and she drove us to our starting point at a Buddhist temple just south of the Sangchuto Rd bridge. I took it as a good sign that Buddha himself was overlooking us as we entered the water. She set us up with lifejackets (although we had our own for the kids) and a dry/wet bag for our stuff, helped us into the boats and set us on our way. The first half of the trip was outside of town with lots of beautiful, lush trees lining the river. We passed several islands and saw many beautiful birds along the way including a kingfisher, a swan goose and many more. Before long, we reached the famous Bridge on the River Kwai. It was fun to kayak under such a famous bridge – a really fun way to see such an iconic structure. From this point, the trip becomes less scenic as the banks are lined with resorts, restaurants and stuff. We passed under a second bridge right by our hotel and soon after we reached the end of our tour at the Chinese Temple. Our guide was there to pick us up as promised and dropped us off at our hotel. This was such a fun family activity. The water on the River Kwai is tranquil with a very gentle current, in fact the water is glasslike in many places. There was very little activity on the river and we didn’t see another boat until we got to town. The 2-person kayaks were very wide and stable and we never felt we were in danger of the kids falling over the side or tipping the boat. This morning, we walked to the main street and hired a private driver & car for the day to take us to Erawan National Park. We had intended on taking the public bus from Kanchanaburi to Erawan National Park, but given how tired and jet lagged we still were, the extra cost (~$11 USD) seemed like a very cheap luxury. 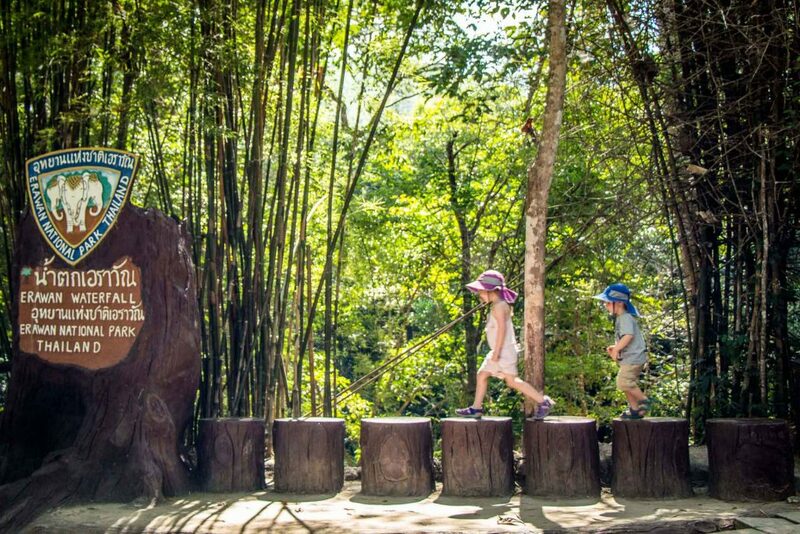 Erawan National Park is home to a great family-friendly attraction. 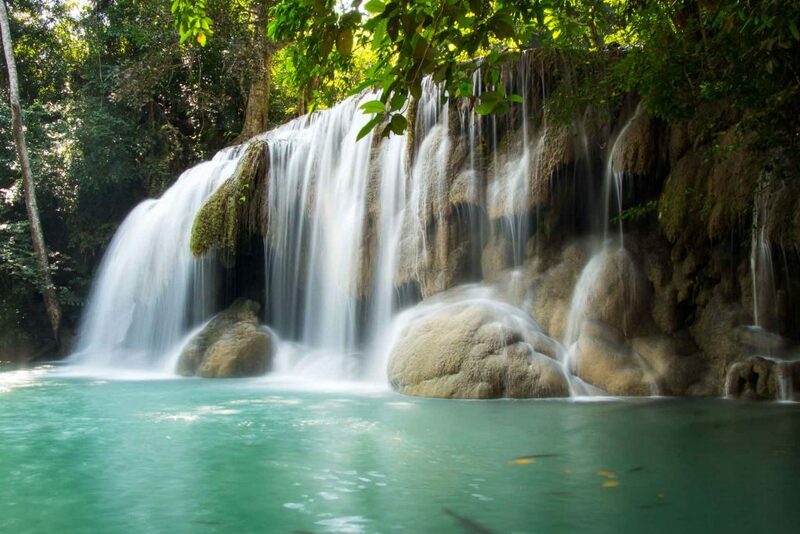 Erawan Falls is a series of seven beautiful waterfalls, each with its own swimming area at the base. The walk to the first four waterfalls is reasonably easy, mostly along a paved pathway through thick jungle. There are a few stairs here and there, but anyone reasonably fit will have no issues. Our kids hiked all the way to the fifth waterfall themselves. I’m sure they could have hiked all the way to the top, but the quality of the trail deteriorates as you get near the fifth waterfall. The nice, paved path is gone and is replaced by huge tree roots and large rocks to navigate over. The kids enjoy climbing over stuff like this, but it slows them down so much, we didn’t have the time to let them hike all the way. So, after reaching the fifth waterfall, we decided to walk back down to the third waterfall to go swimming as a reward for a good hike. The third was our favorite – it’s a single free-falling waterfall with no cascades; a very beautiful waterfall in a beautiful setting. The water close to the waterfall was too deep for the kids, but along the edges it was shallow enough for them. Our daughter loved the little “kissing fish” in the water; the ones that eat the dead skin off your feet and ankles, although, like me, she can’t stand the tickling sensation for very long. Note that after the second waterfall, there is a checkpoint where you need to leave a cash deposit for each plastic bottle you intend to bring beyond. They mark each bottle and when they confirm each has been returned you get your money back. This is an excellent idea as the jungle was virtually spotless beyond this point, with no litter along the trails at all. No food is allowed beyond this point either. 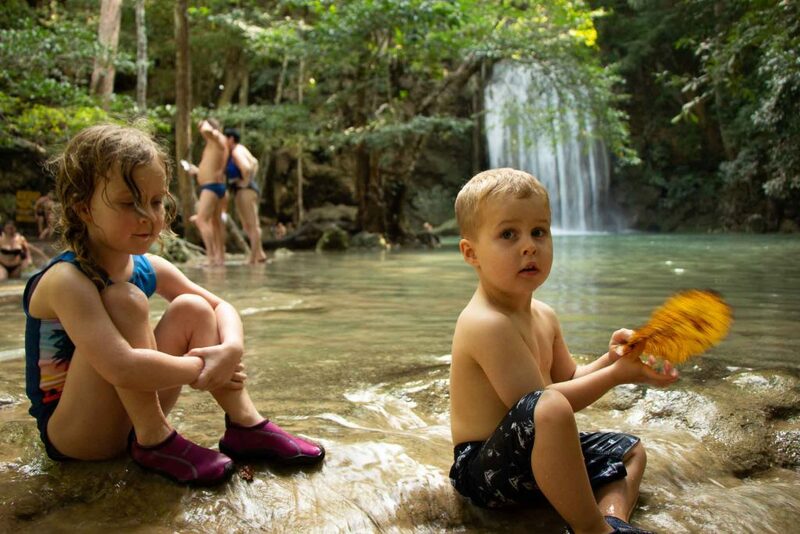 Erawan Falls is a ways from Kanchanaburi, but it’s worth the effort and was our favorite thing to do in Kanchanaburi. To get there, you can take a local bus or hire a private driver. To find a driver, simply talk to your hotel or walk up the main street (as we did). 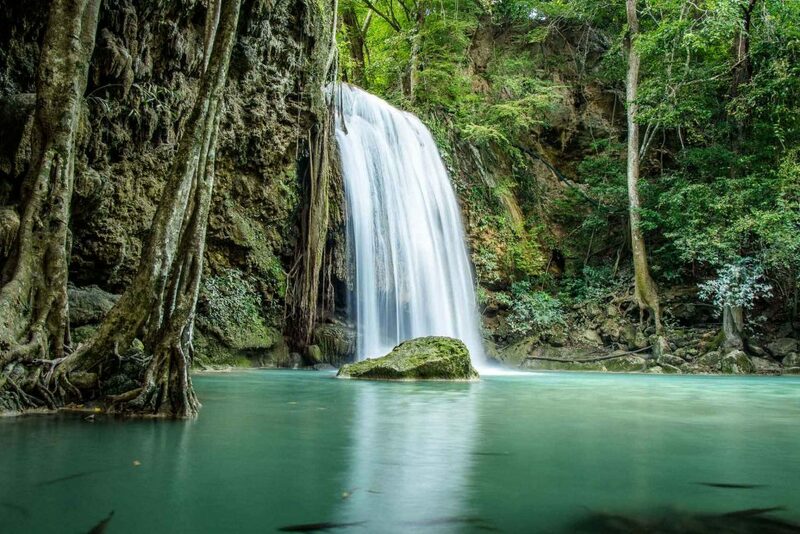 If you wish to visit Erawan Falls from Bangkok, a private day trip is a good option. Tip: One of our iPhones went for a swim in one of the swimming areas below a waterfall and was completely dead by the time we were able to retrieve it. Do yourself a favor and have a dry pouch if you plan to spend much time near the water in Thailand. 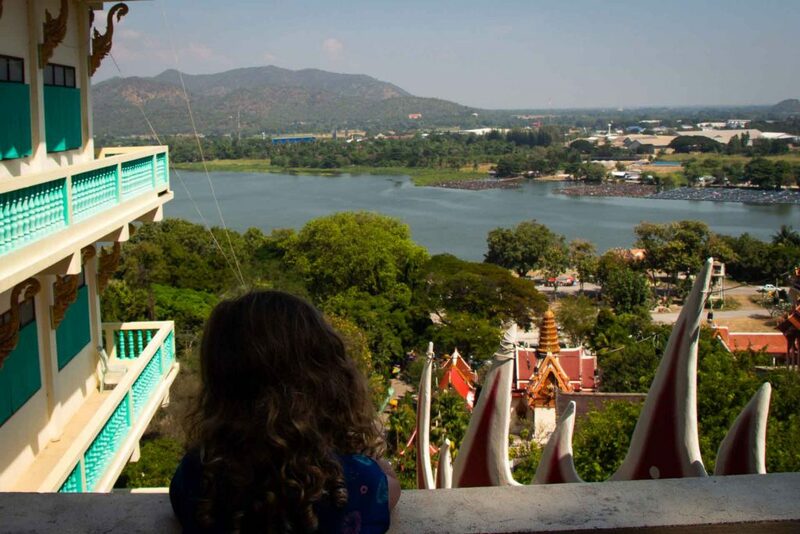 We stayed at the Good Times Resort in Kanchanaburi. We loved it; in fact, it’s one of our favorite hotels we’ve stayed at with our family anywhere. 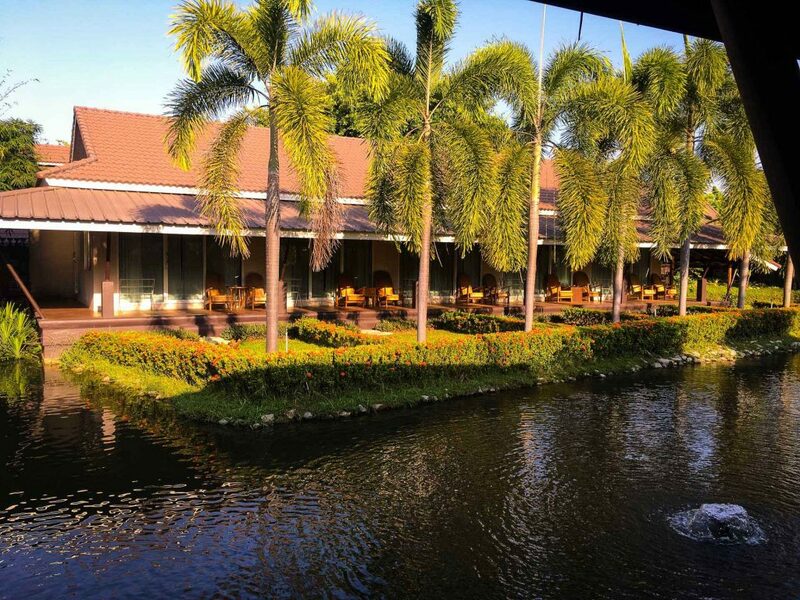 It’s located right on the River Kwai and features beautifully manicured gardens surrounding large fish ponds and a swimming pool. Our family was comfortable in our large lagoon-view room with 3 beds, and we enjoyed their excellent buffet breakfast every morning. The hotel restaurant is right on the water and also serves lunch and dinner. The food was very good and the prices were reasonable given it’s a hotel restaurant. We paid our own way here and we recommend this hotel for your family as well. Ave Thai Food & Goodbeer: We enjoyed our Thai food here so much, we ate here twice. The staff were very friendly to our kids and brought them paper and crayons to play with while we waited. Good Times Restaurant: This was the river-side restaurant in our hotel. As mentioned before, it had very good Thai food at reasonable prices. Bell’s Pizzeria: Our kids don’t love Thai food, so on occasion we take them somewhere just for them to make sure they are getting enough to eat.